Use the Pega Intelligent Virtual Assistant for Pega Sales Automation Outlook add-in to improve email productivity. In this enhancement, the natural language processing (NLP) algorithm analyzes email content and suggests tasks and email responses to the sales representatives. Match scores prioritize the best actions for every email. The actions of sales reps become the baseline for models to train and increase the accuracy of suggestions over time. 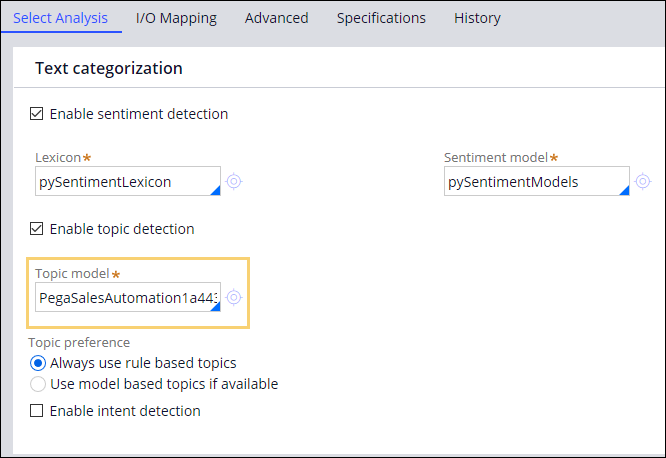 Pega sentiment analysis determines whether the message from a prospect or a customer is positive, negative, or neutral. To configure the NLP analysis in your application, enable NLP suggestions. In the navigation panel of App Studio, click Settings > Application Settings, and then click the Microsoft Exchange tab. In the Microsoft Exchange integration section, select the Enable Suggestions Using NLP check box. In the navigation panel of Dev Studio, click App, and then search for and open the Data-Channel-Email class. In the Email Channel Configuration tab, open or create an Email channel. For more information, see Optional: Creating the Email channel. In the Email Channel Configuration tab, click Actions > View XML, and then search for the pzInsKey value. In the header of Dev Studio, search for and select the EmailChannelHandle dynamic system setting (DSS). In the DSS, paste your pzInsKey contents into the Value field, and then click Save. In Dev Studio, click the name of your application, and then click Channels and interfaces. In the Create new channel interface section, click Email. Enter your email channel name. Optional: Enter the channel description. Optional: Leave default values for the Email handling, Intelligent routing, and Default Entities Mapping on Case Property sections. Select the Record training data check box. Optional: Select the Enable subject analysis check box. On the Text analysis tab, add your topics with the appropriate matches. On the Behavior tab, add suggested cases and replies. Associate these cases with the topics that you added. When you save the channel, the system creates the default text analyzer with your channel configuration. After configuring the channel, associate topics to the reply templates. Open your Email channel and then click Actions > Open text analyzer. For the steps below, use the PegaSalesAutomation1a443529ec5e46c991b0565447a7b812 text analyzer rule as a configuration example. Open the PegaSalesAutomation1a443529ec5e46c991b0565447a7b812 text analyzer rule. Add the topic model from your text analyzer. For new models, select the Always user rule based topics radio button. For models that you have already trained, select the Use Model based topics if available radio button. Clear the Enable intent detection check box. Rule based topics option in the text analyzer works with a taxonomy. A sample taxonomy is included in the Create Task topic. For more information, see Text analytics. 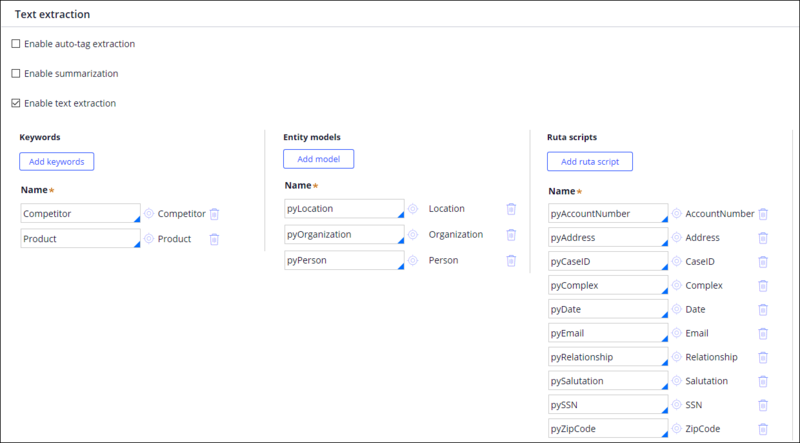 Save keywords and models in your implementation ruleset. When users use NLP, training data is submitted for a review. You can add the training data to the model based on your business context. For more information, see Train entity models with a single click. Pega Sales Automation™ has a Create task case for you to edit and use. To implement NLP suggestions for your business cases, review the suggested custom configuration steps for cases. In the header of Dev Studio, search for and select OutlookSuggestCase section to view the suggested cases and a configuration example. To map entities, drag the parameters to the Create Work action. Click the View properties icon next to the cell you want to modify. Click Actions, and then drag the parameters to the Create Work action. To support the NLP feedback mechanism, drag AssociatedID as one of the parameters. If you want to support NLP suggestions for other cases than Create task, in the header of Dev Studio, search for and select the 8.2, compatible with Outlook crmNewHarnessButtons_Mobile section. 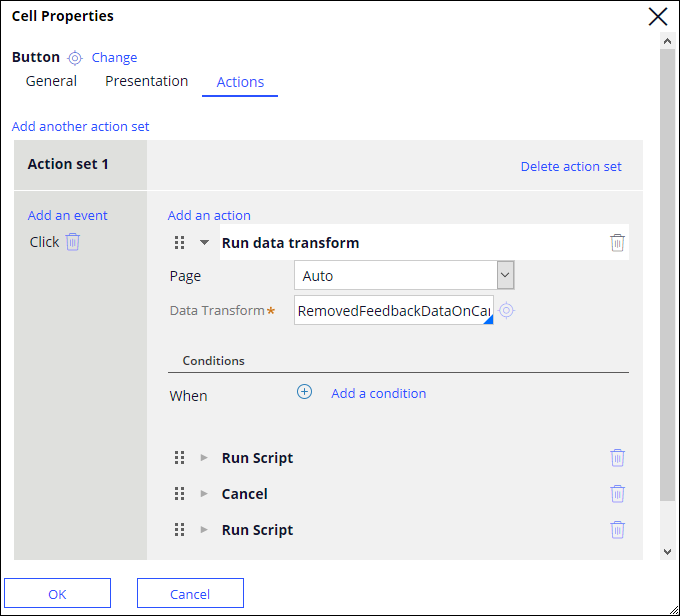 To configure the Discard button, click View properties, and then on the Actions tab, add RemovedFeedbackDataOnCancel data transform. 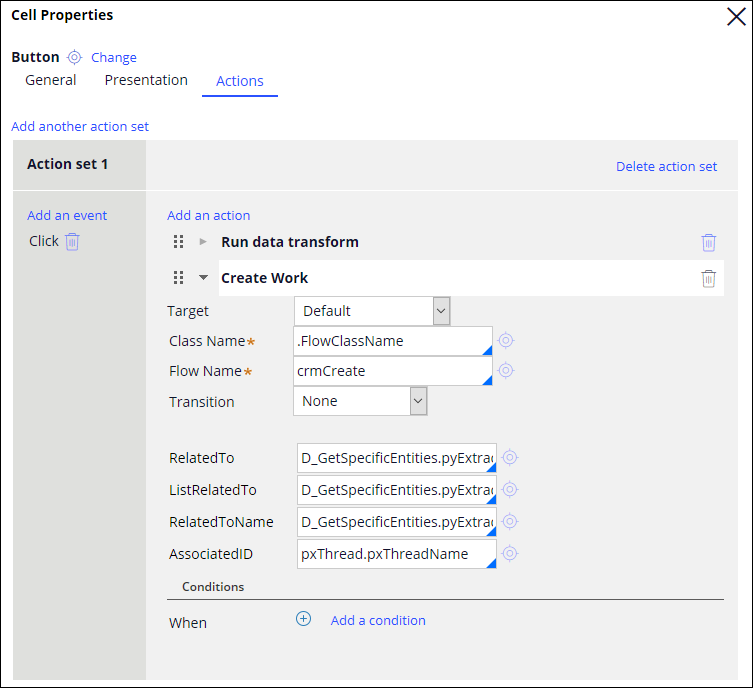 To configure the Create task button, click View properties, and then on the Actions tab, add SetFeedbackForNLP data transform. To review all the detected entities, open the D_NLPEntities.pyExtractedEntities page group. To customize your implementation, use the D_GetSpecificEntities.pyExtractedEntities page group and GetSpecificEntitiesAsExt activity as an extension example. Pega Sales Automation has the Defuse, Competitor, and Product reply templates for you to edit and use. To implement NLP suggestions for your custom replies, review the suggested custom configuration. Suggested replies sections are limited on iOS and Android Mobile Outlook clients. NLP suggestions are not supported by default when users create emails or appointments or when they select appointments or meeting-related items. By default, the reply templates are configured for external users. If you leave a template with a blank value or select an incorrect value, both internal and external users can access it. To view the suggested reply configuration and extension points, open and use the PopulateSuggestedReplies data transform. Use the D_NLPEntities or SelectedWorkPage data pages to detect entities if you want to customize the reply templates content based on competitors or products. In the Dev Studio header, search for and select the SuggestedRepliesWithUserType map value rule, and then edit it by configuring your suggested replies templates as internal, or external. On the Microsoft Exchange tab, in the Outlook add-in settings section, enter your internal domains.